The temple by itself is not a great attraction but it is the surroundings that are important from a tourist’s perspective. 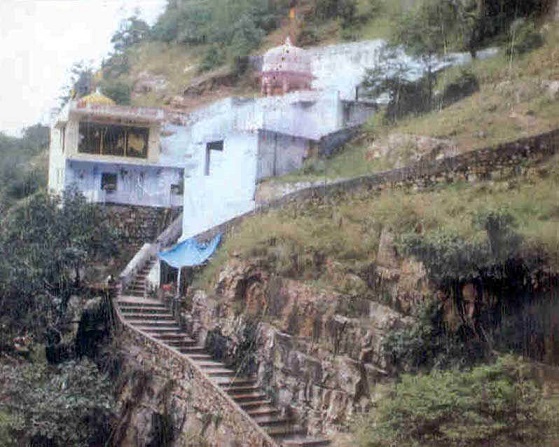 You can also notice a small water fall that drips directly on the idol of Lord Shiva and people in the area say that the water fall never dries up even during the scorching summer that Rajasthan is known for. The temple is en-route to the Ranathambore park and you can take guidance from the RTDC Hotel Vinayak on the way. On a given day you may miss tiger sighting at the park. But, about 38 kms off Sawai Madhopur is Palighat famous for its crocodile sanctuary. If you hire a jeep from Sawai Madhopur it could cost you about Rs.1500 (about $25) for a trip up and down with the wait time included. You can expect to see a wide variety of crocodiles and some of them can be even scary. For those who have already seen a similar sanctuary in Singapore, memories will keep coming back. Home for over 50 tigers, you can expect to see at least a couple of tigers with some 6 safaris but less than 4 safaris your chances could be dim. Zone 3 is a scenic stretch and zone 10 is replete with varying greenery and water bodies. The neighbourhood of the sanctuary had lot of human population until recently. But, the authorities have now relocated the villages and therefore the sanctuary holds promise to become a desirable wildlife habitat. You can also see some natural water holes as well as some that are created by the forest department. This sanctuary could soon become the focus for visitors intent on tiger sighting. Draw up an extended itinerary so that you can savour the best of Rajasthan at a leisurely pace.